The Laserfiche Digital Transformation Model helps businesses discover the ultimate roadmap to guide them along the path of digital transformation. The DTM is made up of five phases to help you get through the process of transforming your business into a digital workplace. 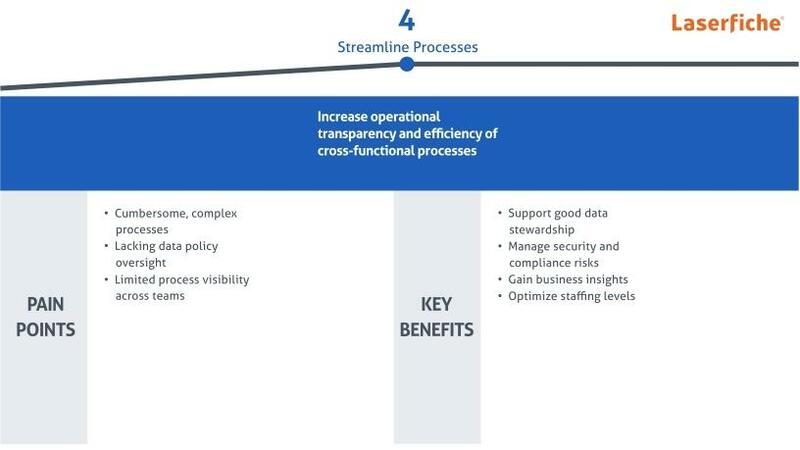 Phase four is about gaining more visibility into your operations and thus be able to increase the efficiency of cross-functional processes, in other words: streamline. Lack of oversight can make it difficult to manage automated processes that impact multiple parts of the organisation. Increased insight into process performance provides the information you need to improve compliance, increase accountability and transparency, and minimise complexity. * Difficulty integrating those outside your organisation (such as customers and vendors) into processes. A common process such as filing documents should be automated at this point to make it easier for employees to attend to tasks that need more focus. Noscotek assisted Egoli Gas with streamlining its business processes. Egoli Gas provides services that are dependent on its network of underground gas lines. The installation and maintenance of these gas lines need to be compliant to the rules and regulations of the City of Johannesburg. COJ regulations state any installation or maintenance would need to be cleared by a Wayleave Certificate. A Wayleave Certificate is best described as the right to cross land. Any party that wishes to put infrastructure or services in place that involves crossing another's property, needs to first seek approval from the legal property holder, normally done and managed through a formal Wayleave application, review and approval process. This application management and approval process can become extremely cumbersome and a challenge to manage in larger numbers and volumes. This is true for both the applicant as well as the service provider and land owner, since a single application could easily involve more than 25 affected parties. The third party needs to wait for 25 or more affected service providers to respond to the Wayleave application before it can continue with its plan to install infrastructure. "In the past, Egoli Gas had no means of tracking the hundreds of Wayleave applications that they received," says Freddie van Rooyen, Noscotek Laserfiche Engineer. After implementing a streamlined Laserfiche solution, Egoli Gas is able to receive, track and respond to all Wayleave applications that it receives within a matter of minutes. While using the Laserfiche process, Egoli Gas can accurately report on any of its current and historic Wayleave applications, identify bottlenecks in the process and automate escalations for urgent applications. It also has quick access to the documentation that was automatically generated by Laserfiche, the time it took to respond to the application, as well as reporting on who is requesting the most Wayleaves responses. These metrics can be used to analyse and further streamline the process, enabling Egoli Gas to continue providing fast, efficient services that are future proof. By the end of this phase, Egoli Gas's business processes will be easily adopted across the company within Laserfiche; it will have complete and consistent data; it will be able to measure successes and failures by making use of tools such as visual dashboards and built-in reports; and will have the ability to include other people, such as customers, directly into their processes. To find out how Laserfiche can help you and in which phase of the DTM your business is, please click here for a free online assessment. For a free demo and to learn more about Laserfiche, contact Bianca Bornman, tel: (+27) 11 100 4678; email: bianca@noscotek.co.za; web site: www.noscotek.co.za/laserfiche. Laserfiche is a leading global provider of enterprise content management software empowering organisations to take control of information and business processes. With intuitive on-premises and cloud solutions for document management and process automation, Laserfiche improves productivity, efficiency and strategic decision-making for organisations looking to transform into a digital workplace. For more than three decades, Laserfiche has fostered an active user community that shares ideas and inspires solutions. To learn more, visit http://laserfiche.com/about-laserfiche.